Come Join the FUN in the Challenge Forum! The Challenge Forum at Gotta Pixel is a great place to get your creativity flowing, and to grab some freebies too! This month, I’m hosting the “Oh So Quotable” challenge. I love quotes because I can convey so much feeling with one quote or poem or phrase on a page and it can encompass such a feeling. To me, scrapping is not only to record my life but to convey emotion as well. August is when we took our vacations as a child. I thought the perfect theme would be – Adventure. What it means to you. A photo with it would be perfect but sometimes you don’t even need a photo. I’ve provided some quotes you can use on your layout, and an optional Word Art freebie! I hope you’ll come join us in the Gotta Pixel Forum this month! 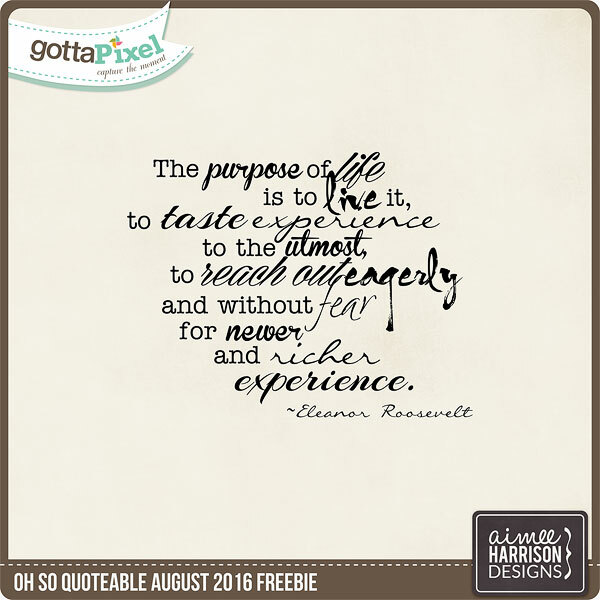 Tagged aimee harrison, challenge, digital scrapbooking, freebie, freebies, Gotta Pixel, oh so quotable, quote.